GETS THE W – Skip Laura Eby sets a target for her teammates Saturday morning during the Whitehorse Motors Ladies Bonspiel at the Whitehorse Curling Club. Laura Eby’s curling foursome won 21 out of a possible 30 ends last weekend at the Whitehorse Motors Ladies Bonspiel. It was the best winning percentage out of the 12 teams competing, and will see each rink members’ name engraved on the annual bonspiel trophy kept at the Whitehorse Curling Club. Eby curled alongside third Tamar Vandenberghe, second Janine Peters and lead Lorna Spenner. Vandenberghe was filling in for Eby’s regular running mate Deb Enoch. The foursome finished with 51 out of a possible 60 points. Ellen Johnson’s rink earned second with 48 points, while event organizer Donna Scott’s team emerged out of a three-way tie to earn third. Scott’s third, Karen Mahoney, drew to the button on her pre-tournament attempt to determine the third-place finish. Scott said the spiel creates a real sense of sportsmanship and camaraderie among female curlers. The tournament was played with a modified scoring format to give teams of all skill levels a chance to compete. After each end, two points were awarded to the winning team, while the losing squad collected one. Blanked ends resulted in a point for each team. Each of the five games played over the weekend consisted of six ends. A new addition to this year’s event included a “Ford Country Do Over,” which allowed players to retake one shot that may have been hogged, burned or missed all other rocks in play. 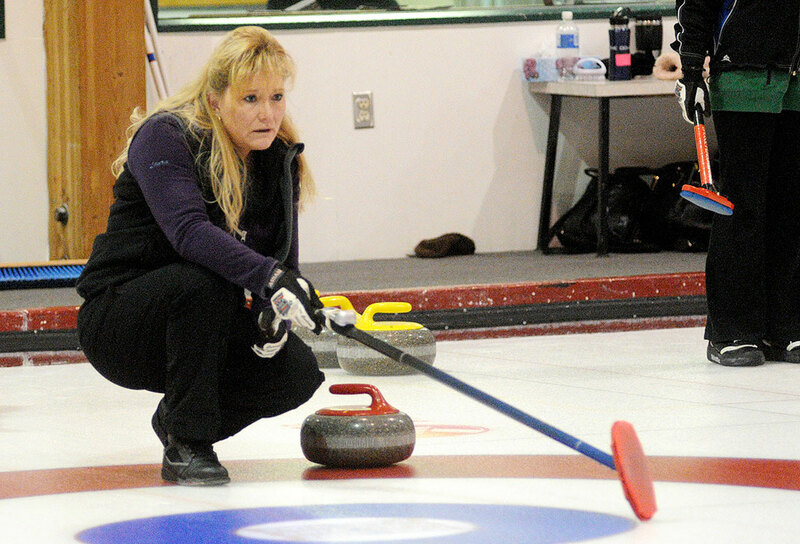 Sherry MacInnis’ rink from Atlin, B.C., used the tournament as a warm-up for the Travelers Curling Club Championships – formerly known as Dominions – slated to take place next week in Halifax. MacInnis’ rink, which also includes Dani McNeil, Bev Murphy and Janis Harper will represent the Yukon on the women’s side of the event. Meanwhile, Pat Paslawski’s rink of Doug Hamilton, Trent Derkatch and Gary Brown will return to the tournament on the men’s side after becoming the first Yukon team to make the playoffs last year. Volunteers are being sought for the 2015 Canadian Masters Curling Championship in Whitehorse. The event is scheduled for March 29 to April 5. Volunteer positions are posted in the downstairs hallway of the Whitehorse Curling Club. The Yukon Curling Association is also seeking a volunteer technical co-ordinator.